The second dish I made with the chicken dumplings is soup, with plenty of vegetables. The weather has gotten cold again, another reason why I didn’t feel like going anywhere today, and soup seemed just right for a light but warm supper. Heat the oil in a large pot and sautee the garlic and ginger until fragrant. Add the onions and cook until translucent. Add the chicken broth and bring to a boil. Let it cook for 10 minutes, add the green beans and dumplings and cook until beans are tender, about 10 minutes. Add the spinach leaves and adjust the seasoning. Stir the spinach into the soup just until they are wilted and the color changes to bright green, then turn off the heat. Hi Sassy! I know what you mean, we are having turkey burn out at my house, and don’t even want to see that bird this week, so we are also thinking Chinese or seafood. Thanks, MrsTweety. I usually make the dumplings with pork too, but I just thought I’d try it with chicken this time, and it turned out pretty good! Hi Watson, thanks! Let me know how the Mrs. likes it. It’s really easy to make. Hello JMom! Your site is so Christmasy! I love strawberries, fresh or with dip! Ipapakita ko kay misis ang recipe na to, hopefully she can make it for our dining pleasure. Hey.. JMom.. love the new color.. and love chicken dumplings.. but i find that pork goes better with soupy stuff.. wat you think..?!!?? A good idea for soup! Infact these days that’s all I really want to eat. Good for this cold weather, easy to put together, and good for the soul! I mad something similar to this, using pork lumpia filling wrapped in egg roll that I cut in quarters. I boiled in chicken broth and added some celery and parsley. 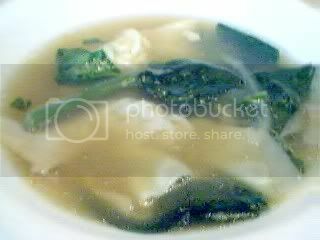 I never knew what to call it, but I vaguely recall having eaten something like it, which was called molo soup. Really one of the nicest treats in cold winter. Oh so I must have been out of touch for a few days..now you’ve got a new template.